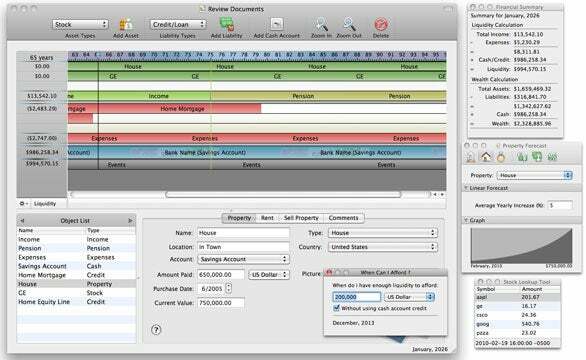 LifeAssets 1.0 offers an interesting twist on the way you view and plan for your financial future. While programs such as Mint and Quicken tend to focus on the rearview mirror, letting you look at your actual expenses to see how you’ve spent your money, LifeAssets tries to set your focus forward, so that you can see where your financial future lies. To get you started, LifeAssets first needs to collect some detailed personal information, including your birthdate, intended retirement date, and most importantly, a complete accounting of all your personal financial information. And it’s important to note that the more thorough you can be about your income and expenses, the better LifeAssets is able to determine how much money you’ll have in the future. Also, there’s no way to import any of your existing financial information. Once you finish entering all your data, LifeAssets displays a linear timeline graph (starting with your current age and running to age 100) that displays all your income, assets, and liabilities. The graph attempts to project how much money you’ll have at retirement based upon your current assets, how much income you’re making, what your pension or 401k is going to produce in the future, and how much your current liabilities are going to steal away from your future earnings. Dragging your mouse along the timeline while you have the floating Financial Summary window open allows you to view your projected net worth at any point in your future. LifeAssets offers you several tools for gathering financial information including tools for finding current stock prices and exchange rates or forecasting when, based upon your assets and income, you’ll have enough liquid assets to make a major purchase with cash. Some of these tools are useful but others, like the Forecasting tool, offer undecipherable, unclear, or negligibly useful information, leaving you wondering what the “tool” was actually meant to be used for. Furthermore, the stock quote tool exhibited odd behavior when I had no Internet connection and then reconnected to the Internet. Once a connection was reestablished. LifeAssets wouldn’t update prices for the stock I’d entered. In order to get current prices I had to delete and reenter the stocks. LifeAssets' unique linear view of your financial future lends you quick insights into where your financial future lies. While LifeAssets is an interesting financial planning application, it’s also the kind of tool that feels like it should be part of a larger, more full-featured financial app. The linear view of your financial future is unique as far as forecasting tools go, but LifeAsset’s uniqueness doesn’t make it a financial planning necessity.